The role of system administrators is often unjustly underestimated, people only think of them when something is on fire – hopefully, just metaphorically, but who knows. Understanding, that your workplace is functioning only due to their uninterrupted vigilance, is probably the nicest gift you can give to them. 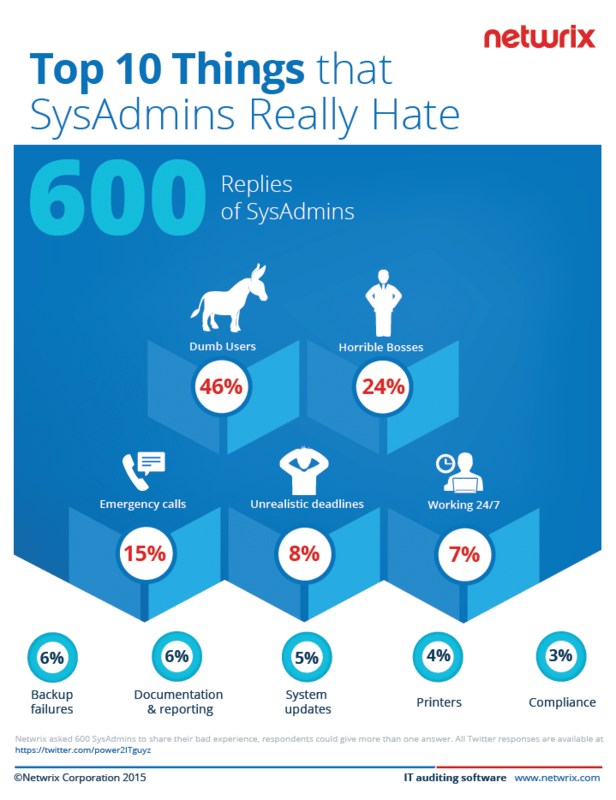 Look around your office and pick out the things that wouldn’t work, may there be no system administrator on guard. Your hard drive infested with viruses, your passwords used by malicious hackers to dig into your accounts or any sort of personal data, and, of course, there wouldn’t be any way you could print out a document at any time you wish. Now think about the guy who’s constantly on the watch for the technical side of your office work. His every day is filled with emergency calls, system updates, failed backups, mitigating risks of downtime: preventing, averting and fixing. Business continuity of your organization depends almost completely on that person. This year, we decided to celebrate their effort and praise their dedication by letting them blow off some steam and complain about their daily nightmare in the form of a tweet. We received over 600 answers from system administrators, which were tainted with either desperation or righteous indignation. You can look at the infographic below and see it yourself – or just read the Twitter feed and feel the purity of emotion. Twenty of the respondents have received ThinkGeek certificates to ease the pain. Let’s hope that life becomes kinder to you guys: users become smarter, bosses become nicer, deadlines get pushed forward just a bit. Happy SysAdmin Day!